The Nun Review | Nerd Much? Have you ever browsed Netflix and seen one of those weird horror films that are clearly knock-offs of better films? That’s what watching The Nun felt like. Directed by Corin Hardy, The Nun is the latest entry in James Wan’s horror cinematic universe that’s attempting to weave together a bunch of scary ghosts and demons from The Conjuring series. The supernatural creature this time around is Valak, a demon masquerading as a nun that showed up in the second Conjuring film. But while the nun was downright terrifying in that film, its appearance here feels like a shallow attempt to recreate what made that being so scary. 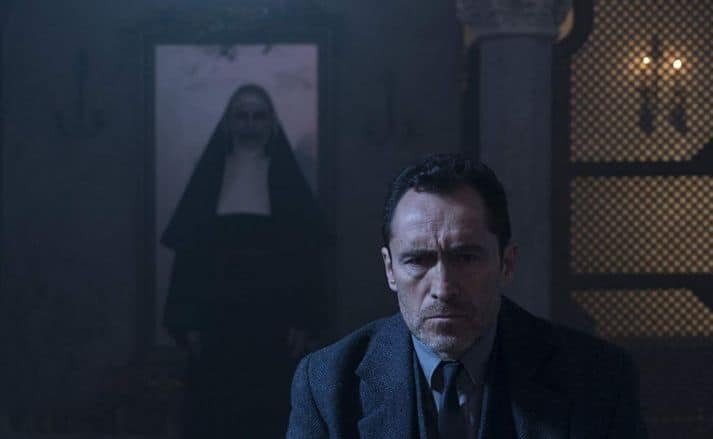 Set in the 1950s, The Nun follows Vatican priest Father Burke (Demián Bichir) and nun-to-be Sister Irene (Taissa Farmiga) investigating a remote monastery in Romania. The convent has gone completely dark following the apparent suicide of a nun, forcing the duo to figure out what exactly happened. This brings them face to face with the demon Valak who has infested the monastery. At its core, The Nun is an origin story for where the demon came from and how it eventually came into contact with the Warrens. On paper, this sounds like a fantastic way to flesh out an intriguing horror villain, yet The Nun is far too focused on recreating the scares we saw in The Conjuring 2. Instead of taking time to establish the demons real wants and needs (outside of just possessing people) we get 90 minutes of a Hardy attempting to recreate James Wan’s style of filmmaking. 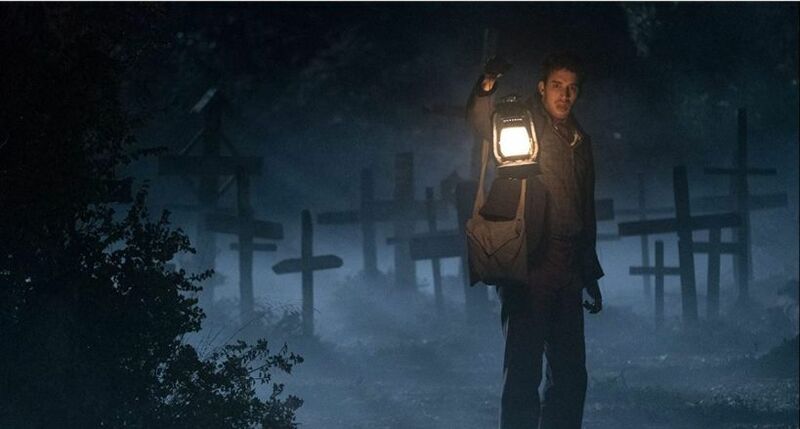 There are multiple scenes of the demon just ominously standing or walking in the background. Sure, the first few times are creepy but it grows very stale, very quickly. Because of this, there is a shocking lack of tension throughout the entirety of the movie. This makes the pacing an absolute mess, with the movie crescendoing in a big horror set piece before we even hit the halfway point. That’s not to say these set pieces aren’t entertaining. In fact, there’s a rather clever one involving a cross filled hallway that feels especially surreal. Yet, these are too few and far between as The Nun heavily relies on jump scares. The terror feels especially toothless, which is surprising given the R rating. As far as we can tell there are two, maybe three scenes that even justify this rating. It’s all very by the books and fails to establish its own style, which ultimately reduces it to another movie set in a creepy castle. Thankfully the cast is pretty much game for anything and give solid performances across the board. Bichir’s Burke is a compelling enough character, even if “the priest haunted by past exorcism” is getting a bit tiresome. You can tell there is more to this character than The Nun was letting on, but it’s never explored in any capacity outside of one flashback. This is mainly due to the razor-thin runtime that gives very little room for any kind of exposition. Taissa Farmiga’s character is the only one that gets any real development and even then it’s pretty minimal. Yet, she absolutely owns this role and delivers a very convincing performance of someone whose faith is tested. I wish The Nun would have given us more time with her before the horror kicked in, as her development pretty much stops once they arrive at the monastery. She even has wonderful chemistry with The Nun’s comic relief, Frenchie (Jonas Bloquet). Speaking of Frenchie, he’s probably the best character in the entire movie. Bloquet has a good amount of natural charisma and his energy can be infectious. Of the three characters, he was the one most in need of screentime. While we won’t spoil how, his connection to The Conjuring universe as a whole is quite important, which makes it even more baffling that The Nun basically forgets about him for half the movie. Even though Farmiga gave a great performance, Frenchie should have been the lead, especially if The Nun wants its big reveal to really land. Yet, this is ultimately the major problem with The Nun. It’s too focused on trying to scare us than giving us a reason to be scared The Nun has no real reason to exist outside of attempting to cash in on terrifying character introduce in another director’s film. Even with some fun set pieces and solid acting, it’s not enough to save this movie. 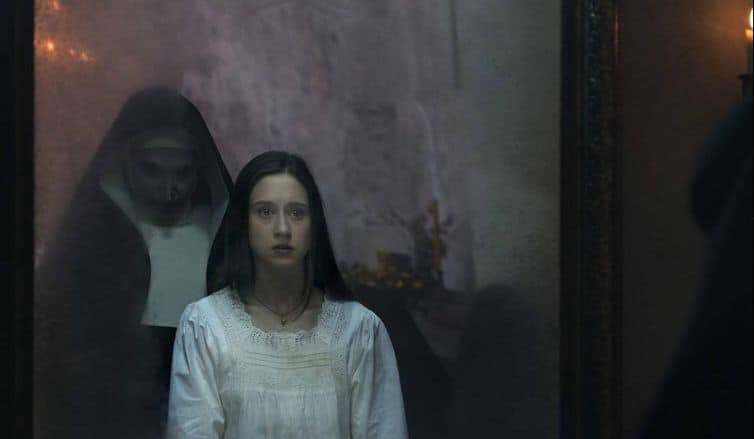 Ultimately, The Nun is a boring and bland horror movie that fails to even come close to the likes of Annabelle: Creation or The Conjuring films.